PHEW!! 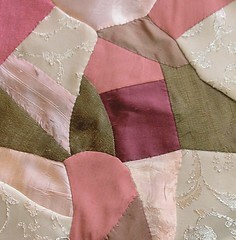 At long last i've finished the Making Memories breast cancer quilts!!! MUCH more of a job than I anticipated but worth it I hope! This is Healing Hearts...named thru a drawing at my CQI group by Shari Jensen. 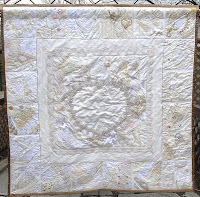 I will be writing a wrap up story for CQMagOnline so be sure to pop over and read more about these quilts there! 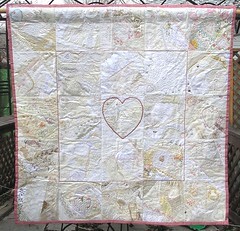 If you click on the pics, it oughtta take you to my Flickr account where you can see close ups of each block! Enjoy! I am in a round robin called Beautiful Beginnings. 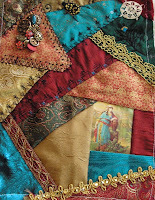 This is the first block for the rr, Vicky Altahib's pretty creation. 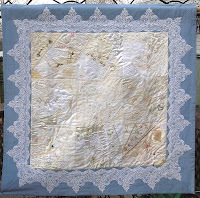 I kept the stitching fairly monotone and geometric in keeping with the eqyptian feel of the overall block. That is my first attempt at a scarab...thinking I need to practice with other methods.... I hope Vicky likes the work! 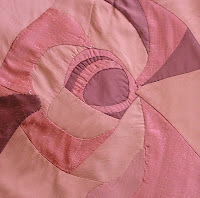 I am madly stitching away, trying to get caught up with things. 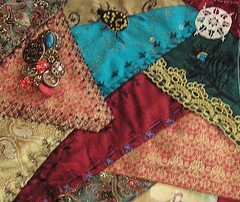 I am doing two blocks for the Art Bra quilt that is to be donated. The theme this year is roses....hopefully I can do these blocks justice! LOL! !